The client is a multinational forerunner in the field of healthcare. Headquartered in Denmark, one of Europe’s major MedTech hub, the healthcare client was actively working on overcoming their organizational challenges to increase their clinical and financial value. To achieve this they were looking at engaging with a predictive analytics services provider. From being a huge buzzword, today predictive analytics has gone onto become a necessity in the field of healthcare. With several advanced analytics methodologies paving their way into the healthcare industry, players are on the constant lookout to enhance their service efficiencies through data analysis techniques. As a result, organizations are uncovering more value from the patient data in their systems, thanks to customized predictive analytics services and predictive modeling techniques that let them hone in on patient data to make accurate predictions and better decisions. The radical transformations in healthcare will further be driven by the increased availability of vast amounts of electronic datasets, and the use of big data and predictive modeling methods that can mine this data to improve healthcare access. Facing similar data related challenges the client engaged Quantzig to quantify the success of their initiatives and deploy predictive modeling strategies to do so. Does your healthcare system have the right market insights it needs to shift your strategy and employ new business models? If not, explore our healthcare predictive analytics services to learn how we can help. The client faced several challenges in analyzing customer lifecycles to devise better marketing strategies and enhance customer service. The second major problem faced by the client revolved around the challenges involved in the development and use of appropriate predictive modeling techniques. The lack of an enterprise-wide data management platform further prevented the client from building a scalable analytics approach to systematically integrate and make sense of the huge volumes of data generated. To counter their data mining challenges the healthcare industry player was looking to engage with a predictive analytics services provider. Quantzig’s customized predictive analytics services were aimed at developing a fundamental data management infrastructure upon which they could build upon. 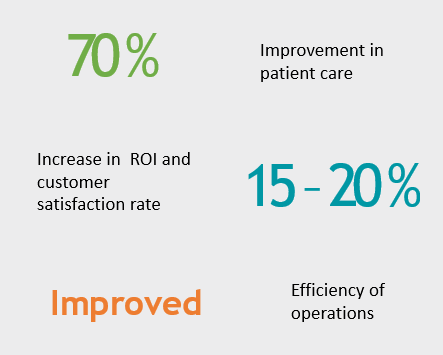 Based on the results of Quantzig’s regression model the client was able to identify inefficiencies and leverage the use of advanced analytics best practices to improve patient care and reduce costs. The overarching goal in healthcare is to leverage historical patient data to improve current patient and business outcomes. Quantzig’s offers customized predictive analytics services, which is a powerful tool in this regard. Finalization of business use cases and data understanding formed the initial phase of this engagement. The predictive analytics services offered included- defining the big data problems that the client wished to address, gathering the required data, and evaluating the different predictive modeling approaches and data mining techniques that could help tackle their challenges. The predictive analytics services offered in the second phase involved data analysis and the use of data mining techniques to predict risks within certain populations. This helped them better stratify their patient populations based on certain risk factors. We then ran a regression on the client’s historic datasets to determine the importance of each parameter in the regression tree. The third phase revolved around the refinement of the adopted process through the use of a response variable and regression model. The aim was to identify the best performing regression model by testing each with a separate dataset to validate the approach and offer cutomized predictive analytics services. This process of stratifying patients into different risk groups was key to the success of the client’s health management initiative which helped them witness a 70% improvement in patient care. Our predictive analytics services enabled them to identify high-risk patient groups ahead of time to improve the overall healthcare outcome. Healthcare players are confronted with several challenges when it comes to leveraging advance d analytics. This necessitates them to partner with providers of predictive analytics services that have a keen understanding of the healthcare system and the expertise to develop appropriate prediction models. Quantzig’s predictive analytics services can help you! Why opt for Quantzig’s predictive analytics services? For more than a decade now, big data and advanced analytics have been at the heart of targeted marketing initiatives and data mining methods that have been developed. Quantzig’s predictive analytics services are aimed at driving operational efficiency across industries. Our advanced analytics expertise has enabled us to help our clients right from the phase of understanding their datasets to the development of predictive modeling techniques, empowering them to make smarter business decisions. Our predictive analytics services focus on the use of historic datasets to develop predictive models that help forecast and generate insights on future events. At Quantzig, we go a step beyond with our predictive analytics services helping our clients to fine-tune the model to improve organizational performance. With customized predictive analytics services you can go beyond learning what happened and why to discovering insights about the future of healthcare. Request a FREE demo to learn how our predictive analytics services can help.